Today I am going to review the Maybelline Color Tattoo 24hr Cream Shadows for you, woah what a mouthful haha! I first heard about these shadows on Youtube, various beauty gurus were raving about them to say the least. I was dying to get my hands on a few of these shadows, sadly they were released in Ireland later than America so we had to wait awhile longer! The shadows were released here in Ireland around April. When I went into Boots they had a 3 for 2 offer on, on Maybelline Cosmetics so of course it was the perfect time to pick these up! If any of you watch my makeup tutorials on Youtube you will know I am addicted to really colourful eyeshadow looks. So you may think naturally I would pick up the vibrant purple and blue shadows right....? Wrong! As I knew debs season was fast approaching I decided to be practical and purchase the 3 neutral colours for my makeup kit. I picked up "35 On and on Bronze", "55 Immortal Charcoal" and "05 Eternal Gold". I tend to use these as an eyeshadow base underneath my eyeshadow. I find that using it as a base is much more beneficial than using it as an eyeshadow alone. As a base it gives the eyeshadows I apply on top of it something to stick to, appear more vibrantly, it reduces fallout and they also last longer. The color tattoo I reach for the most for clients is by far "On and on Bronze". So many people want a brown smokey eye or a brown and gold smokey eye. I actually sometimes combine two color tattoos together like "05 Eternal Gold" and "On and on Bronze", as you can see here. I used eternal gold as a base for my highlight shade and on and on bronze as a base for my eyeshadows on the lid. The color tattoos blend nicely across the eye without dragging the eye area. Personally I like to use my fingers to apply the product, this is because the warmth of your fingers heats up the product thus allowing it to blend more easily. If you don't like using your fingers to apply your makeup I would suggest using a synthetic haired brush as they work best with cream products. My mams friend was coming over to visit from America and she brought me over the next two colour tattoos I own. The packaging and the names of the products are slightly different and that is because of the fact they are from America, the product itself however is exactly the same. These were the two color tattoos that I was extremely excited about, I literally couldn't wait to get my hands on them! The blue shade, "40 Tenacious Teal" I feel is the only one that I would wear on its own, without any eyeshadow on top of it. When I used this for the first time recently I was beyond impressed with the results. The shadow is just so pigmented! 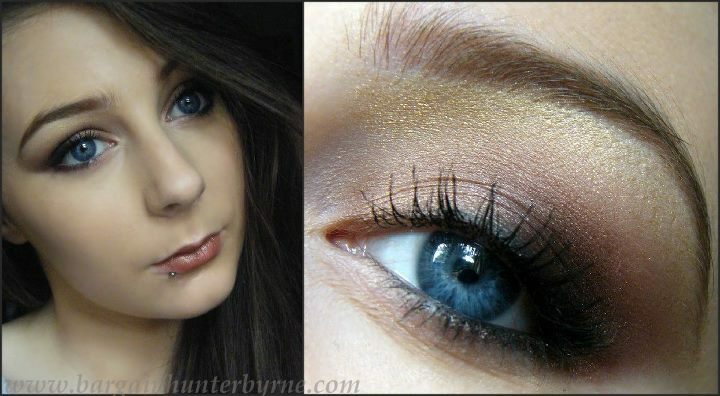 In the picture below I am wearing just the color tattoo on the eyelid without any eyeshadow packed on top. Now after discovering how pigmented this shade was I could not wait to use the purple cream shadow. Unfortunately I was extremely disappointed with this shade. This is the only shade out of the bunch that I own that just does not live up to expectations. Even when I layer the shadow the pigmentation is still very very poor. Below is a prime example of this. In saying this about the purple shadow I still find it works well as an eyeshadow base. I created a purple smokey eye using an e.l.f eyeshadow palette I recently purchased. The e.l.f eyeshadows in the palette do not work well alone, nor does the maybelline color tattoo "20 painted purple". However, used together I created a gorgeous purple smokey eye. So I will still get use out of this color tattoo, it will work well with any of the cheaper eyeshadows I own that might not work as well without an eyeshadow base. As I said the first three color tattoos I purchased were on offer in Boots. I bought the three color tattoos for approximately €15 as there was a 3 for 2 offer on. The final two color tattoos that were brought home for me from America and cost $5.84 each. I definitely do recommend these cream shadows, they are pigmented, affordable, long lasting and easy to work with! I keep meanign to pick these up, although I'll be my usual self and get boring neutral shades. I need to start being more dramatic! Can you tell me the names of the elf colours you used on the purple shadow?? I've been looking for ages to find similar colours. Some of the other tattoos designs incorporate social tattoos, chronicled tattoos, and so forth.